Q: What time do the Ponies swim? A: The Saltwater Cowboys swim the Ponies at “slack tide”. Slack tide is a period of about 40 minutes after the current stops moving in one direction, and before it starts moving in the opposite direction. Slack tide is the easiest time for the Ponies to make the swim. The fire company has announced that this year the Ponies will swim between approximately 6am and 8am on Wednesday July 26, 2017. 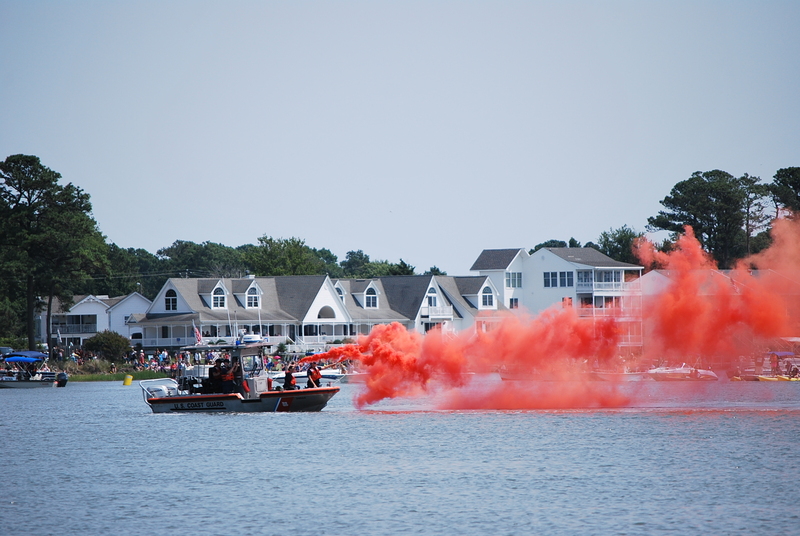 When the tide goes completely slack the Coast Guard shoots off a red flare to signify its time for the ponies to swim. Q: How do I get to the pony swim? A: The best way to get to the swim on Wednesday morning is to catch a free shuttle. 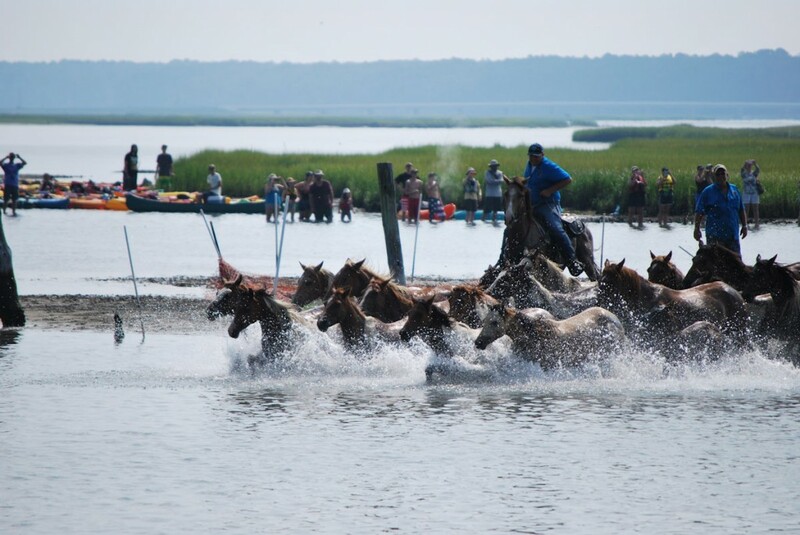 The Pony Shuttle runs between various locations on Chincoteague Island and Veterans Memorial Park beginning at 4:00 am. Check the Pony Shuttle Map to find the shuttle bus stop closest to your lodging location. We recommend getting started early on this day and to anticipate a heavy crowd. Do not drive to the swim! Q: I’m coming into town just for the day, what should I do? 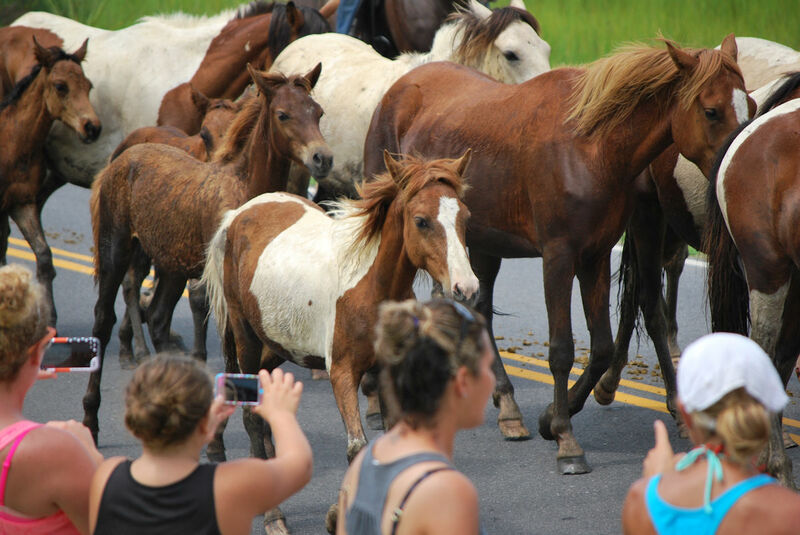 A: All visitors coming in just for the day are encouraged to go to Chincoteague Municipal Center (6155 Community Dr, Chincoteague Island, VA 23336) and catch the free Pony Shuttle. Turn left at the stoplight at the foot of bridge. Proceed to Chincoteague High School and turn right (Hallie Whealton Smith Drive). Continue as directed by Town officials. Additionally, there may be some parking available at the Carnival. Shuttles stop in front of the Carnival to go to the swim and return behind the Carnival. There is no parking at other pick-up points. Q: Is special needs parking available? A: Special needs parking is available at the Chincoteague Municipal Center ONLY. Q: Where do the Ponies come ashore? A: It is important to note that Memorial Park is not the pony landing site. If you wish to go to the landing site, you will need to walk from Veterans Memorial Park to Pony Swim Lane. No seating is provided at either location. The viewing area at the pony landing site (Pony Swim Lane) is marshland and space is very limited. If you walk from Memorial Park to the pony landing site, and you wish to catch a shuttle after the swim, you must be back to the front of Memorial Park within 30 minutes of the ponies coming ashore. Q: How well can I see the Ponies swim from Memorial Park? A: Memorial Park is several hundred yards away from the pony landing site at Pony Swim Lane. You can see the Ponies swimming from Memorial Park but it is not a close up view. However, new for 2017 a large screen will be located in Veterans Memorial Park with a live feed of the swim. You will be able to see a close up of the swim on the screen. Q: Where do the Ponies go after the swim? A: After the swim, the ponies rest for about 45 minutes. Then the Saltwater Cowboys then “parade” the Ponies down Main Street, to the carnival grounds where the auction will be held Thursday morning. The parade route is shown on the Pony Swim Guide. Q: Where should I go after the swim? A: You have options. You can ride a shuttle bus back to your lodging location. You can ride a shuttle bus to the Carnival grounds (where the ponies are going). Or you can walk to the Carnival grounds. The Pony Shuttle Map shows the Pony Parade route and the walking route to the Carnival grounds (they are separate routes). Immediately after the swim, two lines will form in the front of Memorial Park (where you were dropped off for the swim). One line is for transportation to the Carnival (where the ponies are going), and one line is for transportation to the Municipal Center, Motels and other locations. If you are going to a motel, you will first be transported to the Municipal Center where connections may be made to your lodging. Walking from the swim site to the Carnival after the swim is recommended. The distance is approximately 1/2 mile. From the Carnival you can ride a shuttle bus back to your lodging location. Buses will begin to load after the ponies arrive at the Carnival. Service from the Carnival will continue until APPROXIMATELY 1 HOUR AFTER THE PONIES ARRIVE. Q: What’s the deal with all the boats near where the Ponies Swim? Can I get a seat on one of those? A: There are licensed tour boat guides that take people to the Pony Swim by boat. Going by boat will provide you with the best view of the swim. However, spots on these boats for the pony swim are in very high demand, so seats are expensive and you must reserve your spot at least several months in advance. Visit http://www.chincoteague.com/scenic-cruises.html to see a list of local boat tour operators. A: The Town of Chincoteague asks that you please do not carry large coolers, large strollers, yard/porch chairs or large umbrellas on the buses. Bring only what will fit in your lap. Be prepared for hot and humid conditions on swim day. Bring plenty of water, sunscreen, and insect repellant. Q: Are Ponies good swimmers? A: Yes! Ponies are actually very good swimmers. The youngest foals do not make the swim, rather they are transported to the carnival grounds by horse trailer. A: Most of them are members of the Chincoteague Volunteer Fire Company. A few come in from outside locations to help. Q: What else is happening on the Island Pony Swim Day?